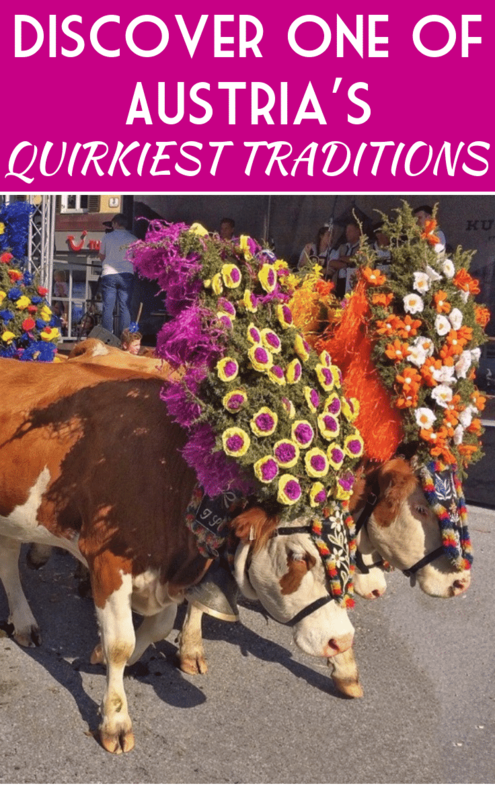 Kufstein in Austria is not one of the most well-known towns in the country, but it is quintessentially Austrian and provides a taste of one of Tirol’s most traditional, but unusual festivals. Kufstein combines modernity with a charming, historic quarter and walking between each is a rewarding assault on the senses. Sitting on the banks of the River Inn, the medieval town of Kufstein is the second biggest in the Tirol region. As I turned into the main street in its old town centre, Romerhofgasse, a smile immediately came to my face. There was an old world charm about the street, it felt as though I was stepping back in time. But the street is not the only thing that leads you to the traditions of Tirol. Visit in the autumn and you may well come across one of the oddest festivals in town – the cattle drive. 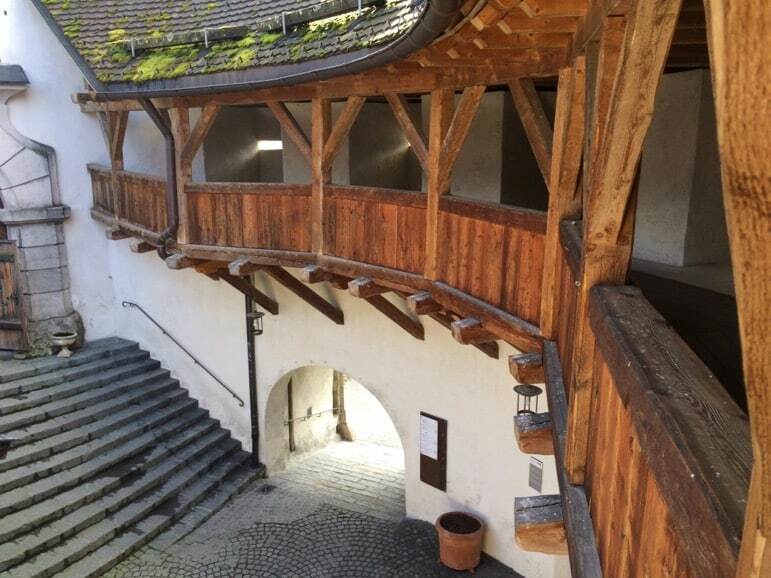 What else is there to see in Kufstein? 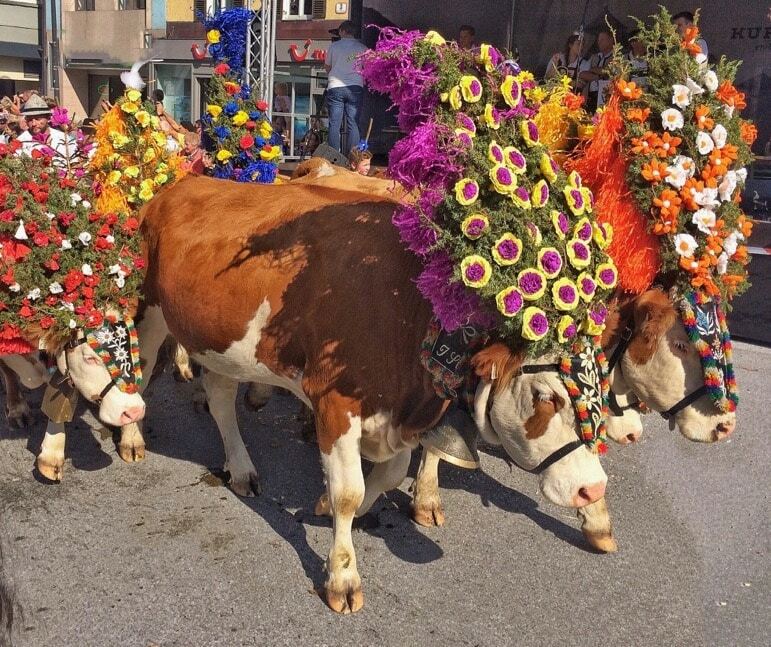 This was to be the highlight of our visit to Kufstein – the annual cattle drive festival or Almabtrieb. This ancient tradition sees farmers bring cows that have spent the spring and summer months grazing high up on mountain pastures back down into the valley, where they will spend the cold winter months. 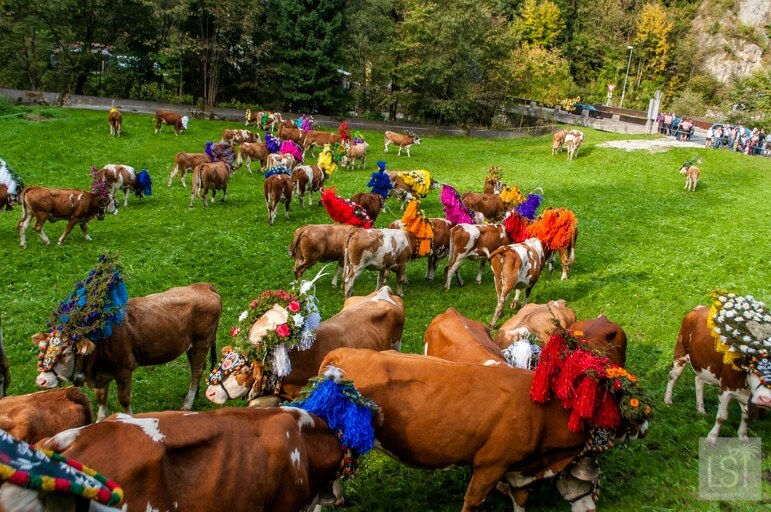 The animal’s homecoming is celebrated across Tirol and after hearing about the event for the past few years, but never having witnessed the colour of it all for ourselves, it was a privilege to be there. We were in a prime spot on the frontline of the route to watch a time-honoured tradition. 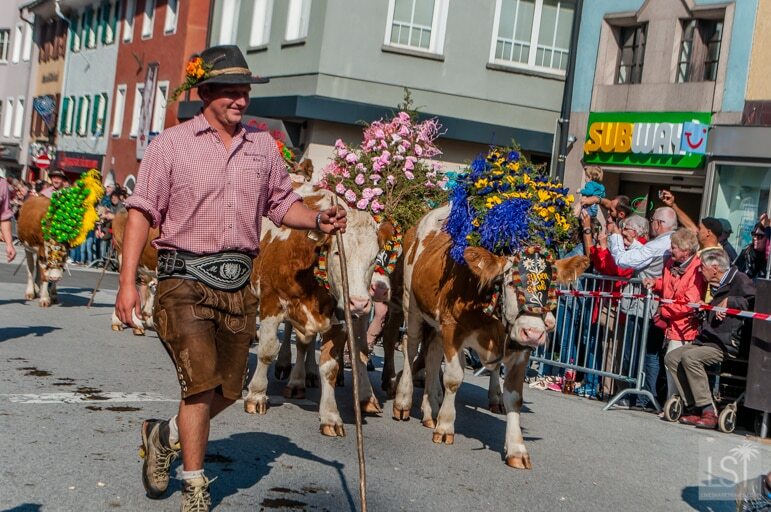 After days of preparation, colourful flowers are ready, the cows are adorned with elaborate headdresses, locals lined the street, music blared, traditional food and drinks were in plentiful supply and a carnival atmosphere abounded – all before the cows had even come close to the town centre. But even with a good half an hour’s wait in store we were never going to be bored. The band piped up, and out came a group of men clad in lederhosen, white shirts with rolled-up sleeves and red waistcoats. Traditional Tirolean dancing really has to be seen to be believed – you’d better watch the video of their thigh and buttock slapping action (each other’s!) below. And it’s welcome to Austria! Moments later the clanging of bells around the necks of hundreds of cows filled the town centre. Long before we saw the cows we heard them and excitement grew among the thousands of people who had lined the street. 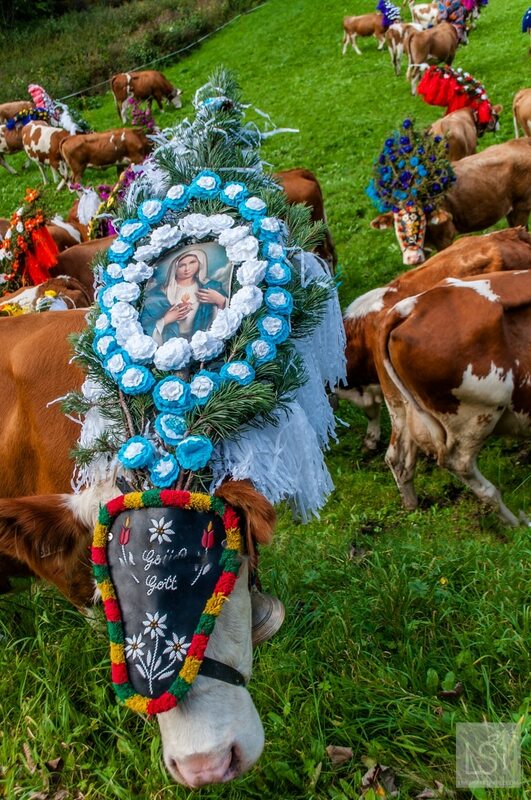 Slowly the first cow came into sight, beautifully festooned with a colourful headdress and quickly followed by a herd of similarly garlanded cows. Carefully the herdsmen guided them through the town, but some were far less orderly than others, doing their own bovine boogie to the oompah music being played by the band. It took roughly 30 minutes for the final cows to pass the expectant crowds and head on out of town. After that, the party continued with music, dancing and plenty of local food the order of the day. 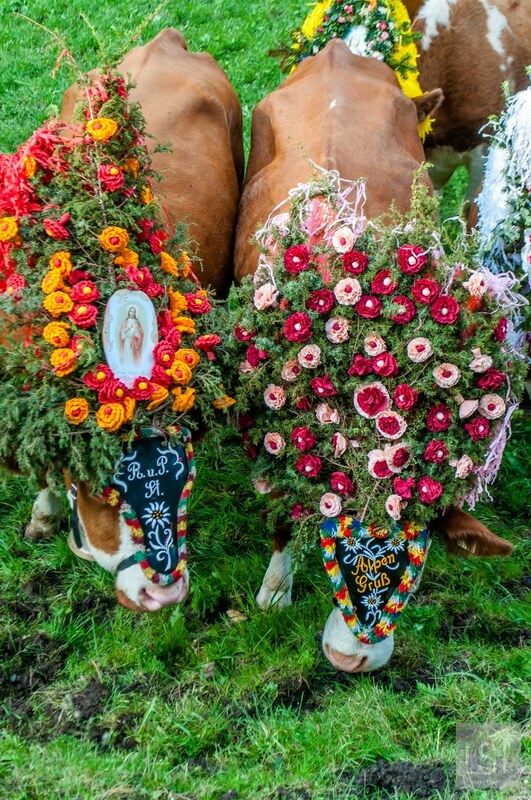 If you get the chance to see this fabulous annual event, grab the bull by the horns, or perhaps the dairy cow by their floral adornment. 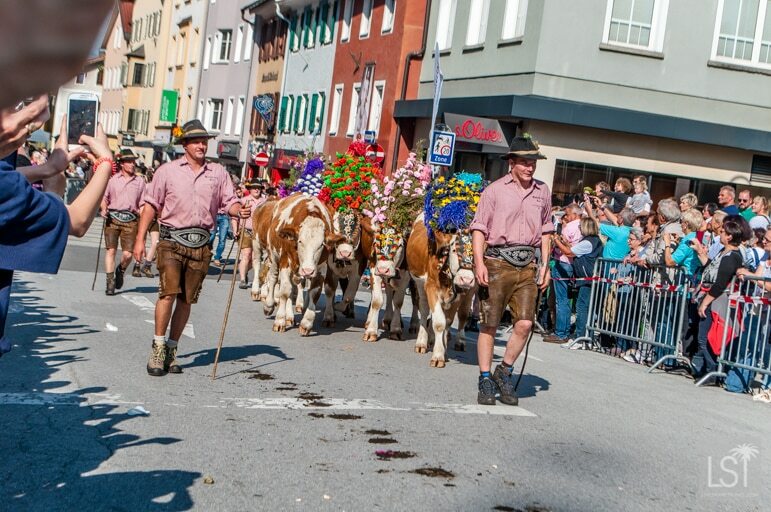 As thrilling and unusual as the Kufstein cattle drive is you want to see more than just well-dressed cows. 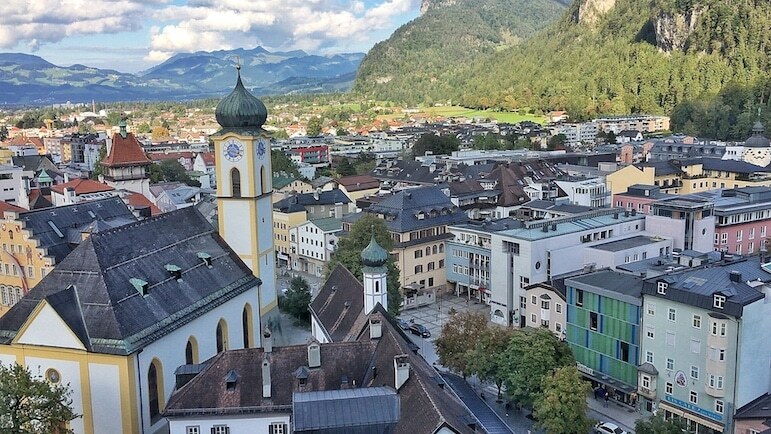 And you’d be in luck because there is much more to Kufstein than its quirky traditions. Its most renowned attraction is a majestic medieval fortress, which dominates from high above the town. Dating back over 800 years, its history is rich, and at 24,000 square metres, it’s a pretty large site too. We journeyed up in the funicular from the middle of Kufstein, and wandered up, down and all around its impressive grounds for over an hour and it had more than enough to hold our interest. 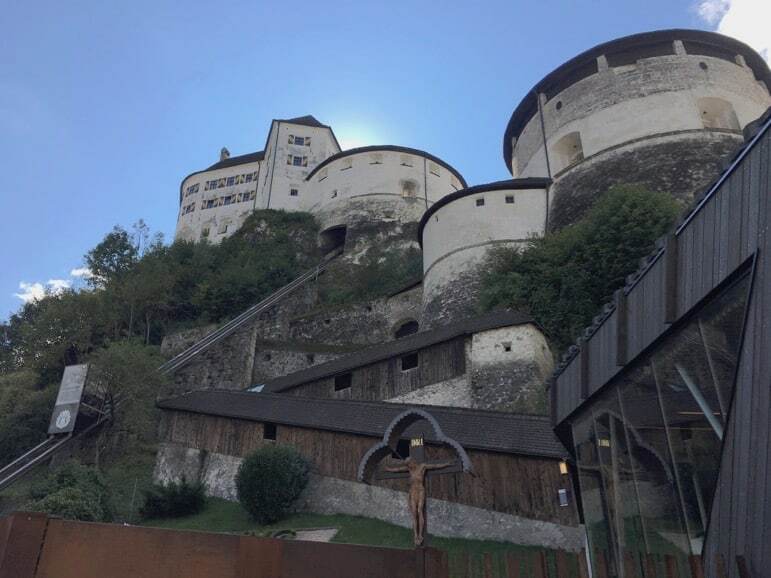 The fortress is home to a museum highlighting Kufstein’s very long history as well as the Heroes Organ – the biggest outdoor organ in the world. It gets played daily around noon and during the months of July and August, it is repeated at 6pm. The fortress has 21 different stations to visit, including batteries of cannons, castle barracks, an ancient torture chamber and a 60 metre deep well. 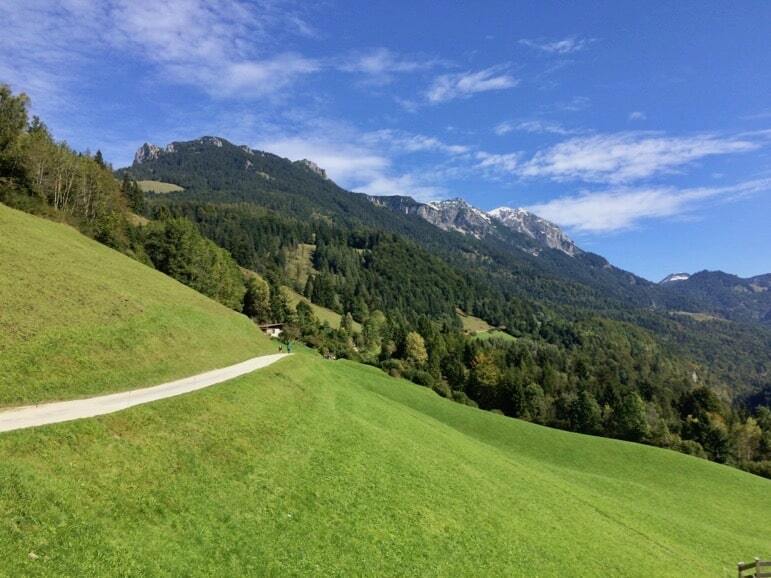 Looking out from the fortress walls our eyes fell on glorious views over the Lower Inn Valley and the Tirolean Alps. 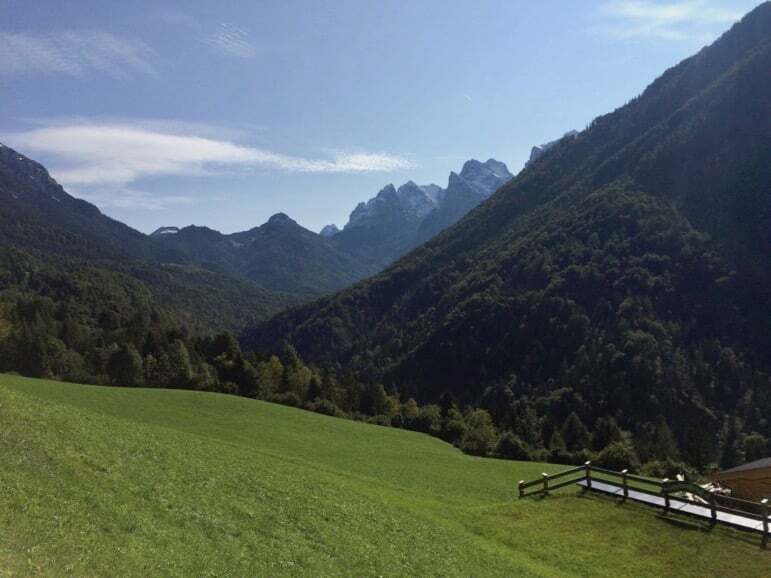 With the Alps all around you, it’s essential that you take time to soak up the mountain peaks and what better than with a walk through the nearby Kaiser Valley. In 2016 Austrians voted the Kaiser Valley the most beautiful spot in the country. I met up with local guide, Mary, and headed out to see just what got them so excited in a country full of spectacular views. 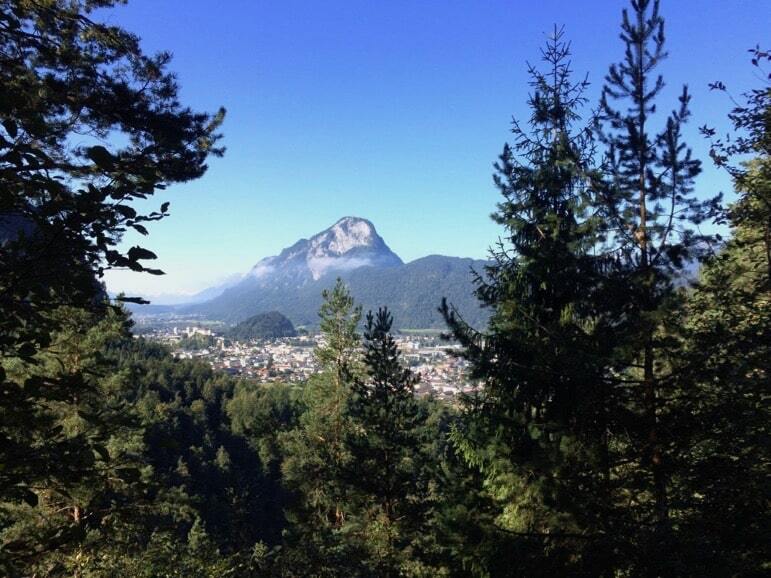 The Kaiser Valley area is just a few minutes’ drive outside of Kufstein and tucked away behind Tirol’s Kaiser Mountains. The walk begins with a fairly steep ascent up 285 steps, but it gets easier after that. This is no endurance test and the walk, while fairly long, is not difficult. I was told less than 40 people live in the valley and the very limited road access is restricted to those few residents, everyone else must walk. The mountainsides here felt remote, untouched even, and with serene beauty. The area fully deserves its reputation for its exceptional beauty – the views will keep you interested, if not spellbound. I was also struck by just how very peaceful and tranquil the walk was. My guide Mary spoke up occasionally to offer her insights and give historical facts. I was amazed when she pointed out areas where the first cave dwellers here had lived, and that was over 10,000 years BC ago. As we walked the landscape remained outstandingly picturesque with the Kaiser Mountains towering above, green pastures rolling out around us and there was even the sound of water flowing freely nearby. At intervals, we passed places where walkers could stop and recharge their batteries with a meal or drink. Then, after two hours we arrived at a little church, Antonius Chapel, which was as far as we would walk that day. 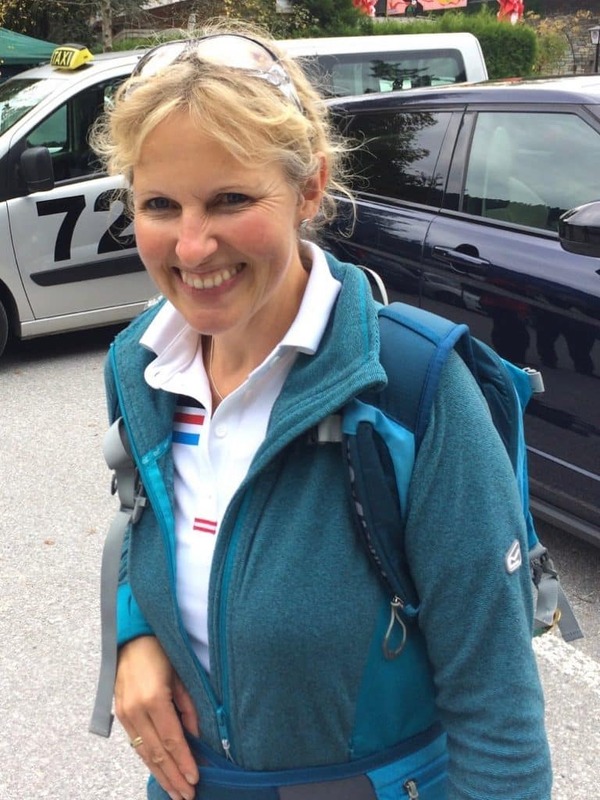 The Kaiser Valley is not the only hike in the area typically for the Austrian countryside the opportunities for outdoor activities are great with hiking routes, mountain bike and fitness trails, horse riding and warm, clean lakes to bathe in. Oh, how the Austrians love their schnapps. I have spotted it on offer in a lift at a luxury hotel and even on a remote hillside, where you can just help yourself. Wherever we went we were inevitably offered schnapps – and I for one was very happy about that. So with the nearby town of Ebbs, home to a schnapps school I figured I’d better enrol and learn more. 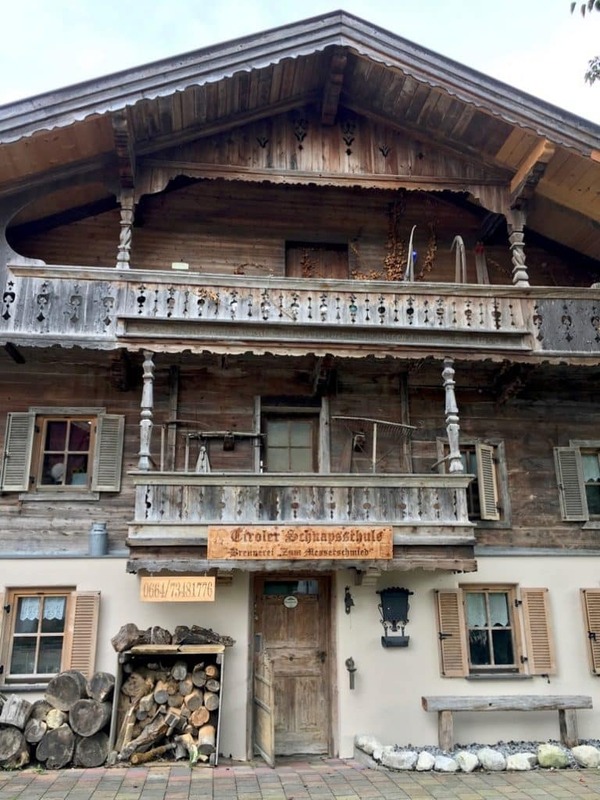 Albert Schmider showed us around his distillery, built in 1536, where he has been making schnapps since 1997. The distillery building alone was fascinating. Since the 1700s everyone in Austria has had the legal right to produce schnapps – they just need to register. 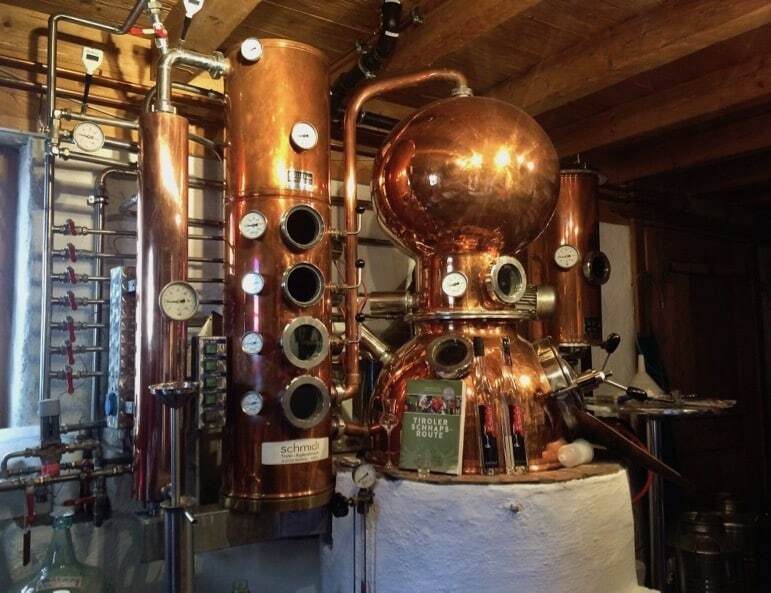 And there are many distilleries in Tirol producing Austria’s favourite tipple. Albert insisted that good schnapps results in no headaches or hangovers and that many older people in the region have a shot before breakfast. Well, it’s certainly one way to start the day with a warm glow. His schnapps is made with fruits from his own land and Albert had a great array of quality drinks on offer. We sampled a variety of his spirits but also picked up some lessons from schnapps school. We now know that the optimum temperature at which to drink schnapps is 18 degrees centigrade. Albert also explained that legally Austrian schnapps must be at least 38% alcohol’ while many are higher in alcohol volume, so I was careful how many I consumed – but they all were delicious. 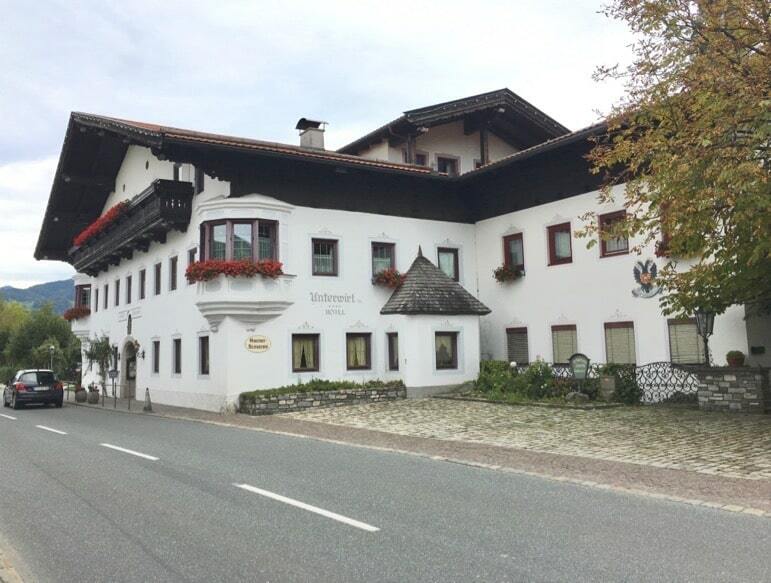 While visiting Kufstein we stayed at the family-owned Hotel Unterwirt, in Ebbs. The food at the Unterwirt hotel was fabulous, perhaps unsurprisingly as it has a gourmet restaurant. The hotel, which dates back to 1419 underwent a major renovation in 2015. The small hotel is relaxed and quite atmospheric, with a cosy bar that is used by local people in the town. There is also a nice, small sauna which I used a couple of times and had all to myself. We dined one night in the Unterwirt’s gourmet restaurant. A side room was set up and the table beautifully laid. Our group of six enjoyed an array of delicious dishes from its six-course gourmet menu. As is commonplace in hotels and restaurants across the country, the food was sourced from local producers. 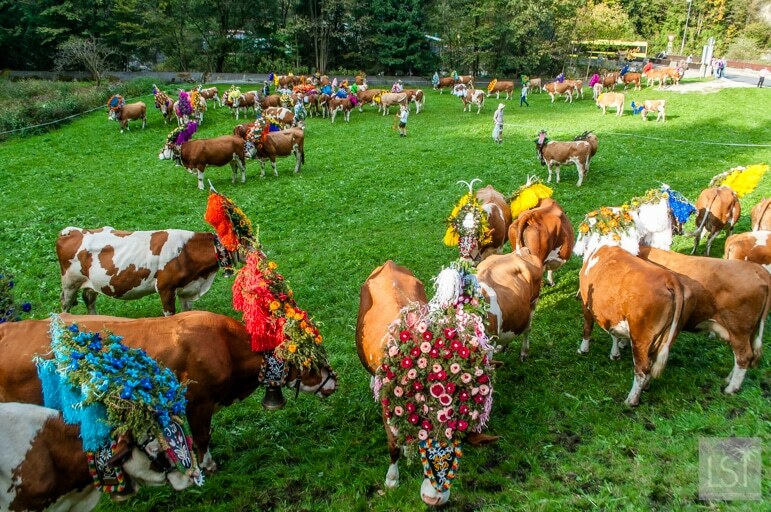 The cattle drive is definitely a highlight of the calendar in many countryside regions of Austria in the autumn, and Kufstein’s was a wonderful example of this intensely colourful festival. But the town and surrounding area has plenty more to give you a taste of life in the Tirolean Alps.